At the bottom of each of my posts, just before the recipe, I offer to you what I was making one, two, and three years ago. Why do I do this? Partly because other blogs I like do it, partly because I want to offer you other seasonal recipes that you might not have seen when I originally wrote about them, partly as a reminder to myself of the things I have made. Truthfully, it’s kind of a pain in the neck. Do you care? Do you click back to those old recipes? In my last post, as I was scrolling through my three years ago recipes, I came across this cake. It was no surprise to see it there – I make it every August and have for the past nine years. 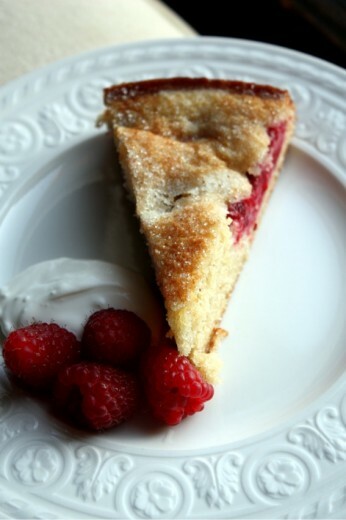 As soon as decent raspberries show up in the market, I make this cake, usually multiple times. Looking at the old sad photo from that three years ago post, I knew I had to write about it again, this time with a better photo. This cake is so simple and it shows off the raspberries beautifully. I find raspberries to be a delicate berry, you don’t want to overwhelm them in either taste or texture. 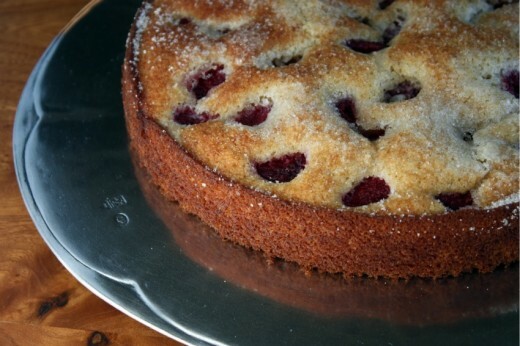 This cake is sturdy but not dry and it has a subtle and yet diffrent (from the Marsala) flavor that allows the berries to shine. I’ve made the delicious side cream with both crème fraîche and sour cream and I have to say, unless you have made your own crème fraîche, save yourself a few bucks and just use sour cream. I have made this cake in both a 9-inch and a 10-inch springform pan. Both work fine. I usually bake with a superfine sugar but used a coarser one for this cake and really liked how the top got a little crunchy. Position rack in center of oven and preheat to 400°F. Butter 10-inch-diameter springform pan. Whisk first 5 ingredients in medium bowl to blend. Combine Marsala and orange juice in small bowl. Beat 12 tablespoons butter and 1 cup sugar in large bowl until well blended. Beat in eggs, vanilla, and lemon peel. Beat in Marsala mixture in 2 additions alternately with flour mixture in 3 additions. Transfer batter to prepared pan. Sprinkle with 1 1/2 cups raspberries. Bake cake until top is gently set, about 20 minutes. Reduce oven temperature to 375°F. Dot top of cake with 2 tablespoons butter and sprinkle with 2 tablespoons sugar. Continue baking until tester inserted into center of cake comes out clean, about 15 minutes. Cool in pan on rack. Release pan sides; transfer cake to platter. Cool to room temperature. Mix crème fraîche and 2 tablespoons sugar in small bowl. (Cake and crème fraîche mixture can be made 8 hours ahead. Let cake stand at room temperature. Cover and chill crème fraîche mixture.) Cut cake into wedges. Top each with dollop of crème fraîche and fresh raspberries and serve. After writing this blog for over two years, I’m surprised by how many things you all don’t know about me. Of course there are plenty of things you don’t know about me the person – Dana. As opposed to me the cook – Dana Treat. For example, even if you have met me, you probably don’t know that I have a hitchhiker’s thumb on my left hand but not on my right. 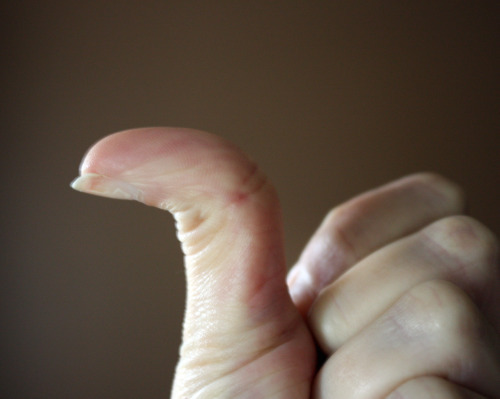 Like my thumb bends all the way back. I kill at thumb wrestling. So maybe it is not surprising that I haven’t shared more fascinating things like hitchhiker’s thumbs on my food blog. But it is a little surprising that I still have some culinary things I haven’t shared. Like the fact that I love honey. Did you know that? I love honey. It is one of my very favorite things in the whole world. I use it in marinades and in salad dressings and I stir it into Greek yogurt for breakfast. I have been known to sneak spoonfuls of it when I am craving something sweet. Living in a city where there are loads of farmers’ markets, it is easy for me to buy good honey. Over the years, I have tasted some wonderful honey from Washington bees. So when the good people at Mohawk Valley Trading Company offered to send some of theirs to try, I hesitated. But the truth is, I was low on honey and the stuff isn’t cheap so I so I replied yes to their offer. 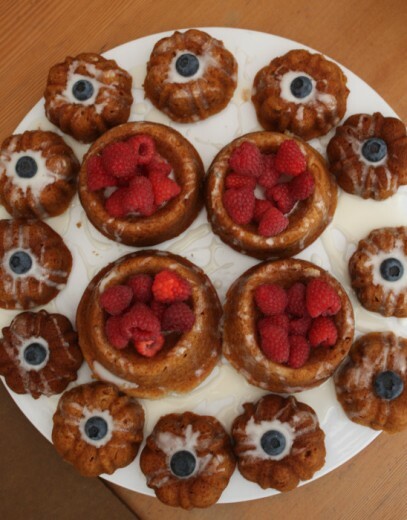 These mini bundt cakes were one of the first things I noticed in the first Ottolenghi cookbook. I had seen a display of the adorable cakes in the window of the restaurant while in London in June. Is there anything more tempting than a little cake sized perfectly for one? For some reason I would totally buy one of these but not a slice of a large cake. Anyway. In the recipe, Ottolenghi mentions that the pans are not easy to find in England but we Americans can find them more easily. (See? Americans don’t like everything super-sized.) I found mine in a local kitchen shop and I would imagine they can be tracked down online. I was a little stumped as to how best to make these. I needed about 20 of them and there are only 12 cakes in the molds. I didn’t want to bake a whole batch, allow the molds to cool, and then bake another batch. 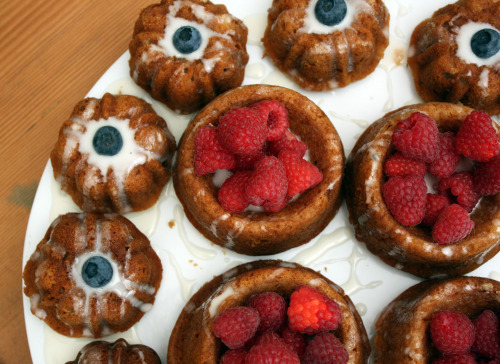 I have another larger mini-bundt pan mold so I doubled the recipe and just hoped for the best. I ended up getting all my mini-bundts, a whole tray of mini-muffin size cakes and a small loaf cake. The bundts got eaten at the party, the boys snacked on my mini-muffins, and the loaf cake is in the freezer. I don’t know if I have ever written a paragraph quite as boring as that one. What I am trying to tell you is that if you make the recipe as written below, I have no idea of how many cakes you will end up with. Just get out all your fun sized pans and go for it. Whatever you end up with will be the most delicately flavored but substantially textured cake. If you leave it plain, it is perfect for an afternoon tea or even for breakfast. 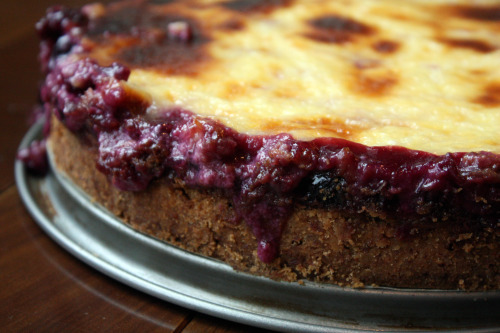 Or you can dress it up with a drizzle of glaze and some lovely berries and call it dessert. And speaking of dessert, my blog duty at Amazon Fresh has started back up again. This week I posted a recipe for a very delicious and very easy cheesecake ice cream. You can read it here. Preheat the oven to 340ºF. Grease your pans with butter. Cream the butter, sugar, and honey together until pale and fluffy, preferably using an electric mixer. Break the eggs into a cup, beat them lightly with a fork and gradually add to the creamed mixture, beating well until each little addition has been fully incorporated. Sift together the flour, baking powder, baking soda, salt and cinnamon, then stir in the dried lavender. Gently fold the flour mixture into the creamed mix in 3 additions, alternating with the sour cream. Carefully fill your molds or pans. If you are using molds, only the fill them to within a ½-inch of the top. Place in the oven and bake for about 25-30 minutes, depending on what size pan or molds you are using. You will want a skewerer inserted into the center of the cake to come out clean. Remove them from the oven and leave them for 10 minutes, then turn out onto a rack to cool completely. To make the glaze, mix the lemon juice and honey together in a small bowl, then whisk in enough powdered sugar to make a thick pourable glaze. Use a pastry brush or a spoon to coat the top of the cakes, allowing the icing to drip down the sides. Garnish with berries, if desired. I’m sort of embarrassed to say that I cooked absolutely nothing last week. Maybe a cheese quesadilla or two for my kids but that is kind of it. Randy was out of town for three nights and I had plans out for two nights plus a date night on Friday. (Fine, I did make myself a baked potato on Wednesday night, but that hardly qualifies as cooking, right?). While it is nice to have a break from the kitchen from time to time, I really do like to cook and I miss it when too many days go by. I was supposed to make a dessert for dinner at a friend’s house on Saturday but her younger son came down with a fever, so we pushed our date to next week. By Sunday, I was desperate. We usually don’t have people over on Sundays – Randy tends to get the Sunday blues – but I was dying to cook and wanted to share the bounty. Fortunately, we only had to make one phone call and – voilà! – instant dinner party. The thing about having people over to our house is I can’t just make dinner. I have to make dessert. I have a reputation to uphold – this site is called Dana Treat, isn’t it? Plus our friend Regan is a huge fan of my treats and I can’t let a good friend down. Tim and Regan have volunteered (volunteered!) to watch our boys on several occasions so we could go see a movie. Friends like that need dessert. Sunday night is casual, so rather than flipping through the wrong baking books, I immediately turned to The Greyston Bakery Cookbook, home of that terrific Apple Torte. 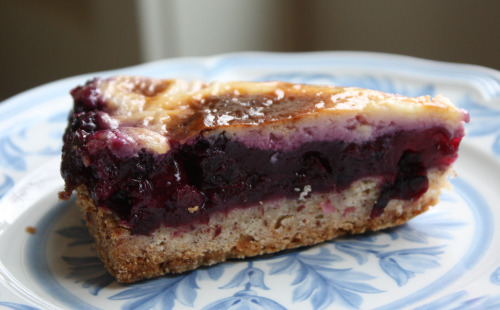 Sometimes desserts just call to me and this time it was this Blueberry Sour Cream Torte. Randy always wants berry desserts and usually I chastise him (berries in March! silly boy!) but this time I could not resist. Yes, I spent $23 on blueberries from Chile (the shame!) but I think we are all just ready for a taste of sunshine. I had my doubts about this one. Going in, the crust seemed awfully dry and like it was going to be too tall. The torte took much longer to bake than the 45 minutes given in the recipe and when I pulled it out, I still wasn’t sure the top was going to be set. I got impatient to take photos before it got dark, so I released the springform pan before it was completely cool. As a result, I had some blueberry leakage. But oh my god, none of it mattered. Just like that lovely apple torte, everything worked perfectly. 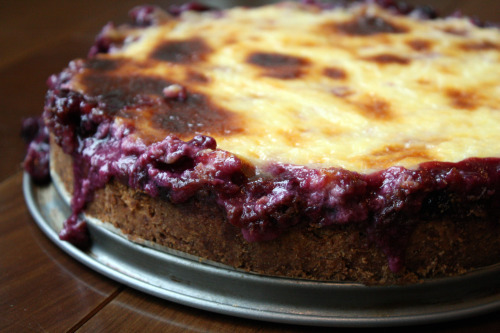 The crust was perfectly crisp (not soggy at all – even with all that wet stuff on top), the blueberries burst in our mouths, and the topping was creamy and just a bit sour. Another winner from this terrific book. The recipe says to serve this with vanilla ice cream or a small dollop of sour cream sweetened to taste with maple syrup. I made blueberry frozen yogurt which tasted wonderful with it. Before you take the collar off the springform pan, I would run a thin knife around the sides, just to make sure you don’t have anything stick. Position a rack in the center of the oven and preheat oven to 400°F. Grease a 9″ found springform pan and line the pan bottom with a parchment paper round. Set aside. In a large bowl, combine the flour, sugar, almonds, baking powder, and salt. Using a pastry blender or two knives, cut the butter into the dry ingredients until it forms coarse crumbs. Press the mixture onto the bottom of the prepared pan. Bake for 10 to 15 minutes, until the crust is golden. Remove the pan from the oven and set it aside to cool on a wire rack. Reduce the oven temperature to 350ºF. In a medium saucepan, toss the blueberries with the sugar, lemon juice, lemon zest, cinnamon, and cornstarch. Cook over medium heat until the blueberries are bubbling and beginning to burst, about 3 to 5 minutes, stirring gently several times. Reduce the heat to low and simmer for 3 minutes. Set aside to cool slightly. In a medium bowl, combine the egg yolks, sour cream, sugar, and vanilla. Mix until well combined. Spoon the filling over the crust. Spoon the topping evenly over the filling and smooth it with a rubber spatula. Bake for 45 minutes, or until the topping browns and appears to have set. Set the pan on a wire rack until completely cool. Release and remove pan sides. 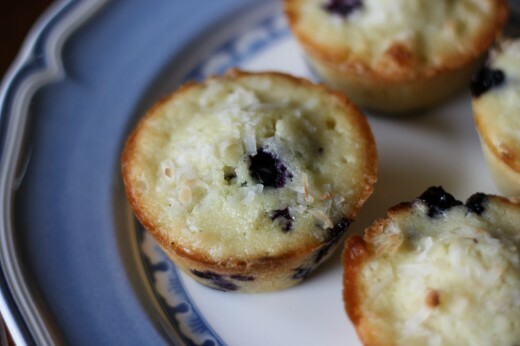 I know it looks like a muffin, but it’s actually an Individual Blueberry-Coconut Pound Cake. In my book, that’s much better than a muffin which, in all my baking adventures, I have never made. I would blame my lack of muffin baking on my lack of interest in breakfast, but that hasn’t stopped me from making coffee cake, scones, or granola. Sometimes I just can’t explain myself. Anyway, this is one of those recipes where it just makes so much sense to double it. It takes no extra effort and all you need is two muffin tins. Or even 1 regular size and one mini-size. Take the ones you aren’t going to eat right away, wrap them well in foil, and put them in the freezer. Then you have a homemade dessert for the next time people drop by unexpectedly. Or for the next time you just need to pull one or two out just for you. This is the original recipe, i.e. not doubled. Beat together butter, sugar, and zest until light and fluffy. Beat in eggs, 1 at a time. Beat in cream, then flour and salt, on low speed until just combined. Stir in 1/2 cup coconut and gently stir in blueberries. Spoon batter into cups and smooth tops. Sprinkle tops with remaining 3 tbsp. coconut. Bake in middle of oven until a tester comes out clean and edges are golden brown, about 25 minutes. Invert onto a rack and cool. OK well, not today. But 20 years ago this year that I graduated from high school and our reunion is tonight. As with every big milestone that comes my way, I have a hard time believing that this much time has passed. And having just celebrated a birthday, I feel kind of, um, old. Actually – maybe it’s just that I feel tired because for some insane reason, we are hosting (and I am cooking for) this reunion. Now before you think that I have completely gone off my rocker, I went to a very small high school. There were only 45 people in my graduating class and only about 15 or so are coming. So along with spouses or significant others, we will have somewhere around 30 people here. We have a good party house – an open floor plan and french doors that open to the patio outside, but any way you slice it, 30 is a lot of people to have in your house. And a lot of people to cook for. Uncharacteristically for me, I haven’t planned obsessively regarding the menu. Usually if I have any kind of party – even a small dinner party – I spend a lot of time thinking about what to make and tracking down all the right recipes. Maybe because it’s summer and I just feel like we have a lot going on, tonight just kind snuck up on me. Several months ago, Randy and I talked about how we should handle the food and I brought up either having it catered or doing a potluck. He thought the potluck idea was “cheesy” and I thought finding a caterer and pricing it and going over menu ideas sounded exhausting, so here I am catering it myself. People may find it strange that I find the idea of working with a caterer more tiring than cooking all the food myself. I admit – it’s weird. But that’s me. Now, I am not usually one to brag but I have to do so for just a moment. When all is said and done, I will have made all of this (except the cheese and crackers and the salmon) in two days. In the few years that I have been a personal chef and mother, I have learned to be really fast when I cook. I can multi-task incredibly well – the only area in my life where I can. But even I am impressed that I am accomplishing this much in this short a period of time. Done bragging. Part of the secret to this success is choosing recipes that don’t require a ton of work or time. I usually advocate choosing things that can be made well in advance, but because we only have one (over-stuffed) refrigerator, I couldn’t do too much too far ahead of time. I will give you one great tip. I made both the potato and pasta salad yesterday and there is a TON of both of them. The only way I could store them in my fridge was to put them in gallon zip bags and stack them one on top of the other. I have done this before and it works beautifully. The recipes I am going to share today are both for dessert. This time of year it seems almost a crime to not use the berries that are overrunning the markets. I couldn’t decide whether to feature raspberries or blueberries, so I did both. 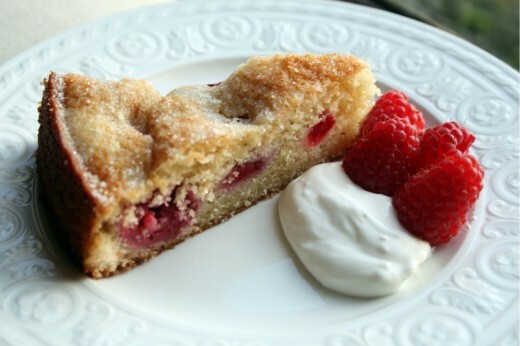 The raspberry cake is something I make multiple times a summer. It is one of the most bang for your buck recipes out there. In just about an hour you have a cake that is fresh tasting with a complex flavor and also looks beautiful. Even if you are not a baker, you should have this in your repetoire. 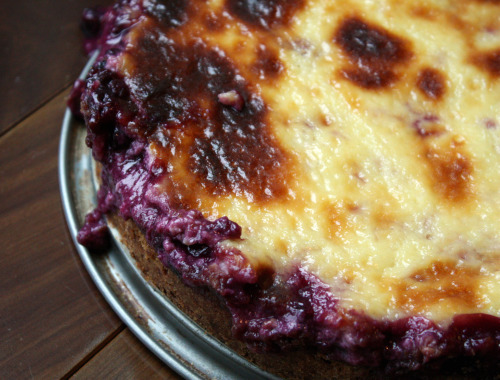 As for the blueberry cobbler – it is about the easiest thing I have ever made in my oven. And, now that it is the day after the party, I can tell you it was the most commented on of the desserts. It’s not a beauty but it doesn’t really matter when it tastes this good. I have made this in a 9 inch springform pan for years and it turned out fine. additions alternately with flour mixture in 3 additions. Transfer batter to prepared pan. Sprinkle with 1 1/2 cups rasberries. Bake cake until top is gently set, about 20 minutes. Reduce oven temperature to 375 degrees. Dot top of cake with 2 tbsp. butter and sprinkle with 2 tbsp. sugar. Continue baking until tester inserted into center of cake come out clean, about 15 minutes. Cool in pan on rack. Release pan sides; transfer cake to platter. Cool to room temperature. Mix creme fraiche and 2 tbsp. sugar in small bowl. (Cake and creme fraiche mixture can be made 8 hours ahead. Let cake stand at room temperature. Cover and chill creme fraiche.) 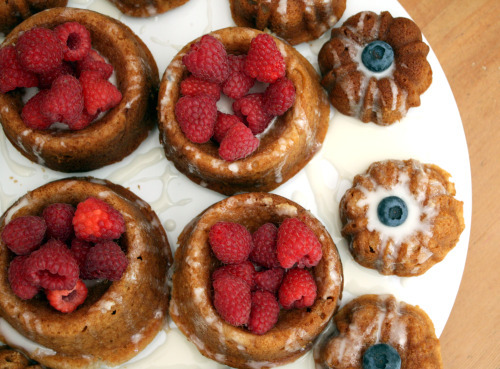 Cut cake into wedges and serve with creme fraiche mixture and additional raspberries. I don’t know who Bill is but this is one easy recipe. For my party, I doubled this and baked it in a 8×11 inch pan. I put the butter in the pan and put it in the oven to melt it. Preheat oven to 375 degrees. In an 8 inch square or other 2 quart baking dish, melt butter. Into a bowl, sift together flour, baking powder, salt, and nutmeg and stir in sugar until combined well. Add milk and whisk batter until it is just combined. Pour batter into melted butter; do not stir. Pour berries into center of batter; do not stir. 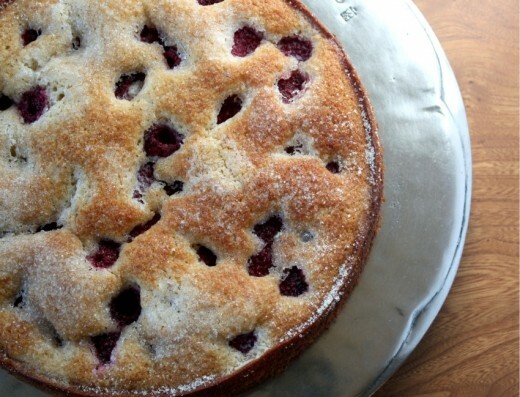 Bake cobbler in middle of oven for 40 minutes or until cake portion is golden and berries exude juices. Serve cobbler warm or at room temperature.